Both sets have decals for ten subjects. Very good quality, interesting and attractive markings that appear to be well researched. The instructions only have full plan views for the RLM 70/71/65 splinter schemes. Both decal packages appear to be well researched with decals are produced to the highest standards. They offer a wide choice of interesting schemes with attractive colour profiles. I feel that the lack of plan views for aircraft wearing other than RLM 70/71/65 is a bit of a shortcoming, as it is obvious from the profiles and notes that an illustration of the upper surfaces at least would be helpful. Only a few schemes are affected however, and no doubt, a reasonable result can still be achieved with the guidance provided, so this issue is far from being a fatal flaw. 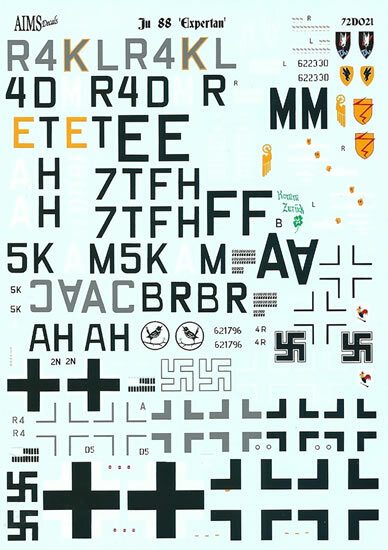 Overall, these very good quality decals provide an attractive range of Ju 88 finishing options. Recommended. 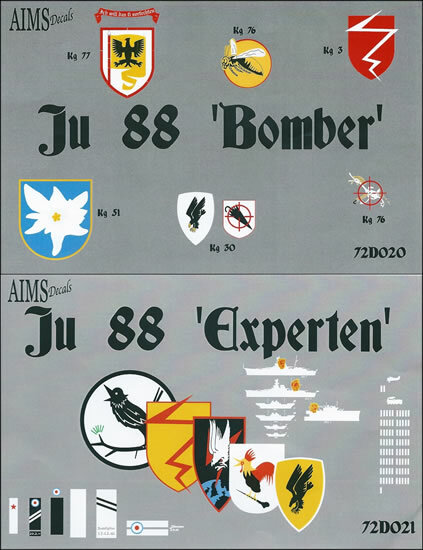 The Ju 88 must be one of the most frequently kitted WW2 twins; certainly, there have been many different brands of Ju 88 bomber and fighter versions in 1/72-scale. The two decal sheets reviewed here are the first that I have seen from AIMS Decals. A quick visit to their website soon reveals their enthusiasm for the Ju 88. In fact, there is a page with an invitation to contact John McIllmurray should you need help with your Ju 88 project. 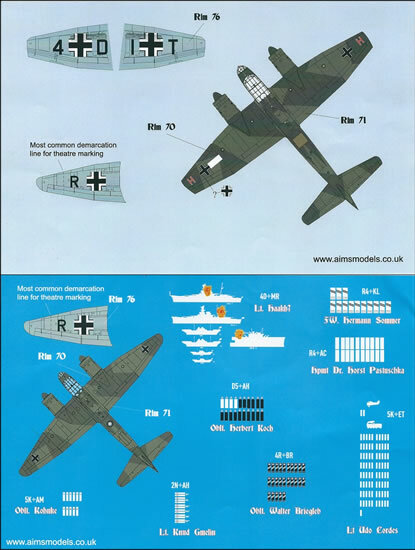 AIMS Models offer a number of interesting decals and accessories related to WW2 Luftwaffe subjects, as well as a few related to other themes as well. I would encourage readers to check out their website. The decals and their instructions come packaged in a zip-lock A-5 sized plastic bag, along with a folded A-4 header sheet. The decals are printed by the Fantasy Print shop for AIMS decals. The production quality of the decal appears to be excellent. The instructions are nicely printed in colour. They provide a single profile for each subject, and in some cases have a separate nose profile to illustrate markings hidden by the engines. RML paint codes are used for paint colours as would be expected. Upper and lower surfaces are only illustrated for one RLM 70/71/65 splinter scheme on the rear face of the header insert. No plan views are given for aircraft wearing overall or mottled colour schemes. The exception is one of the non-splinter schemes has small illustrations of the squiggles on the sides of one of engine nacelle. 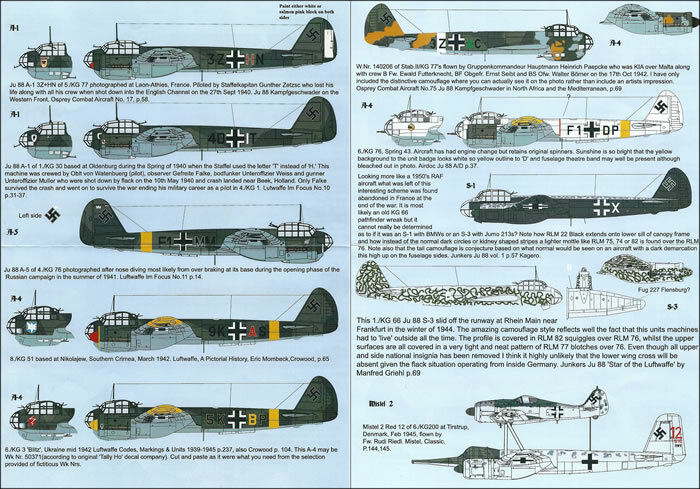 The lack of full plan views, especially of upper surfaces of the non-standardised schemes, seems to be a disadvantage in my view; but it may well AIMS Decals did not have information on the upper surfaces of some subjects. However, they do provide written descriptions of upper surfaces based on their reference images in some cases; so perhaps that the lack of plan views is linked to meeting a price-point with less printing, rather than being due to a lack of information. The accompanying notes to each scheme include a publication reference that served as research for each scheme. There are also various small detail notes and advice where conjecture has been employed. Ju 88A-1: 3Z+HN of 5./KG 77, Leon-Athies, France September 1940. Ju 88A-1: 4O+IT of 1./KG 30, Oldenburg, spring 1940. Ju 88A-5: F1+MM of 4.KG76, Russia, summer 1941. Ju 88 A-4: 9K+AS of 8./KG51, Southern Crimea, March 1942. Ju 88A-4: 5K+BP of 6./KG3, Ukraine, mid-1942. Ju 88A-4: 3Z+AC of Stab II/KG77, over Malta 17 October 1942. Ju 88A-4: F1+DP of 6./KG76, Russia, spring 1943. JU 88S-1 or S-6: +X of possibly KG66, abandoned in France, 1945. Ju 88S-3: B of 1.KG66, Rhein Main near Frankfurt, winter 1944. Mistel 2: +Red 12 of 6./KG200, Denmark, February 1945. Ju 88C-2 or C-4: R4+KL flown by Herman Sommer. Ju 88C-2 or C-4: R4+KL flown by Horst Pastuschka. Ju 88A-5: 4D+MR possibly flown by Lt Haakh (anti-shipping expert), Sicily 1941/42. Ju 88C-2? : 5K+ETflown by Udo Cordes (anti-locomotive expert). 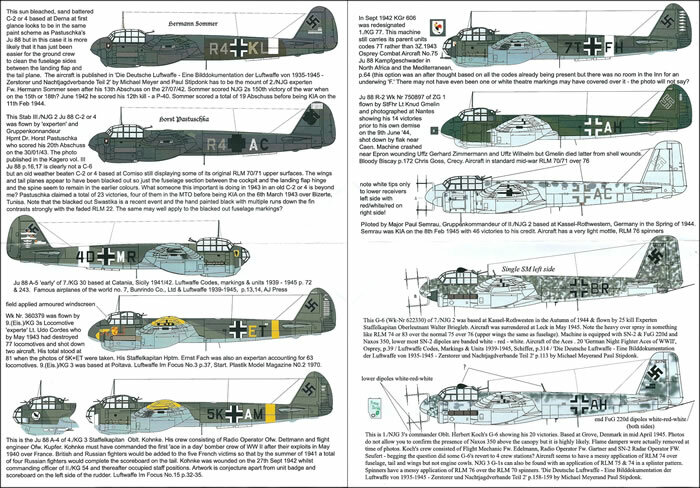 Ju 88A-4: 5k+AM flown by Oblt Kohnke (5 air-to-air victories in one day during the battle if France, and four more in Russia). Ju 88A-4? : 7T+FH of 1./KG77 (previously KGr 606), North Africa, 1942. Ju 88R-2: 2N+AH flown by Knud Gmelin, Nabtes, France, 1944. Ju 88G-6: R4+AC flown by Paul Semrau, Kassel-Rothwestern, Germany, spring 1944. Ju 88 G-6: 4R+BR flown by Walter Briegleb, Kassel-Rothwestern, Germany, autumn 1944. Ju 88 G-6: D5+AH flown by Herbert Koch, Grove, Denmark, April 1945. 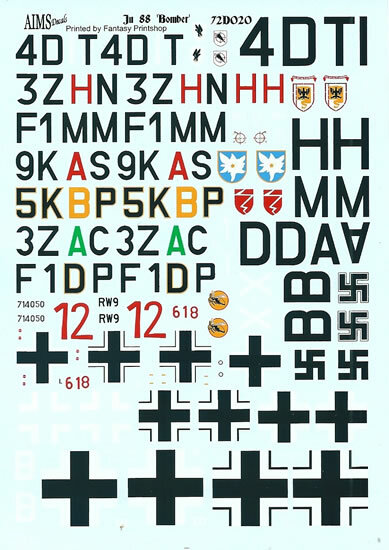 Overall, these very good quality decals provide an attractive range of Ju 88 finishing options.